She was a James Morrison Scholarship Finalist in 2003 and in 2004 was an IAJE Sister in Jazz and received the ASCAP Young Jazz Composer's award in 2008. She also received an honorary mention at the 2009 Thelonious Monk Bass Competition and received the 2010 Bell Award for Young Australian Artist of the Year. In 2010 she was nominated for the Jazz Journalist's Awards for Up and Coming Artist of the Year, and received the award of No. 1 Acoustic Bass Rising Star in the Downbeat Critic's Poll. This same year she received 2nd place at the BASS2010 Competition in Berlin. Linda has performed with the musicians such as Joe Lovano, Steve Wilson, Vijay Iyer, Dave Douglas, Kenny Barron, Geri Allen, Fabian Almazan, and Terri Lyne Carrington. She is currently the bassist with guitarist, Pat Metheny. 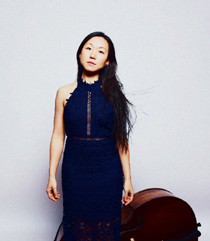 Linda is an active double bassist, electric bassist and composer, composing music for various ensembles and short films, also participating in the BMI Film Composers Workshop and Sundance Labs at Skywalker Ranch. Linda composed for Sabrina McCormick's short film "A Good Egg" which was featured in the New York Shorts Festival. In 2009 her self-released debut trio album "Entry" with Obed Calvaire and Ambrose Akinmusire received some critical attention. It was listed in Artforum magazine as one of Vijay Iyer's top ten of 2009. Her second album "Initial Here" released on Greenleaf Records in 2012 features a quartet with Dayna Stephens on tenor sax, Fabian Almazan on piano and Rudy Royston on drums with special guest Jen Shyu on vocals. This album was mentioned several times for album of the year in various jazz polls. "Sun Pictures" is her third release - a quartet album recorded live at WKCR studios featuring Ben Wendel on tenor saxophone, James Muller on guitar and Ted Poor on drums. Linda is currently working on her second trumpet trio album and an eight-piece group featuring a string quartet - with music that was commissioned by the Jazz Gallery in 2012. She is now a member of Pat Metheny's most recent quartet project.